Volvo XC90 Interior, Sat Nav, Dashboard | What Car? All XC90s come with electric adjustment for the driver’s seat that includes adjustable lumbar support, so finding a top-notch driving position shouldn’t take you long. In fact, it’s one of the most comfortable cars in the class to get behind the wheel of, helped by Volvo’s perennial ability to develop brilliantly supportive seats. The sports seats in R-Design trim are particularly good. 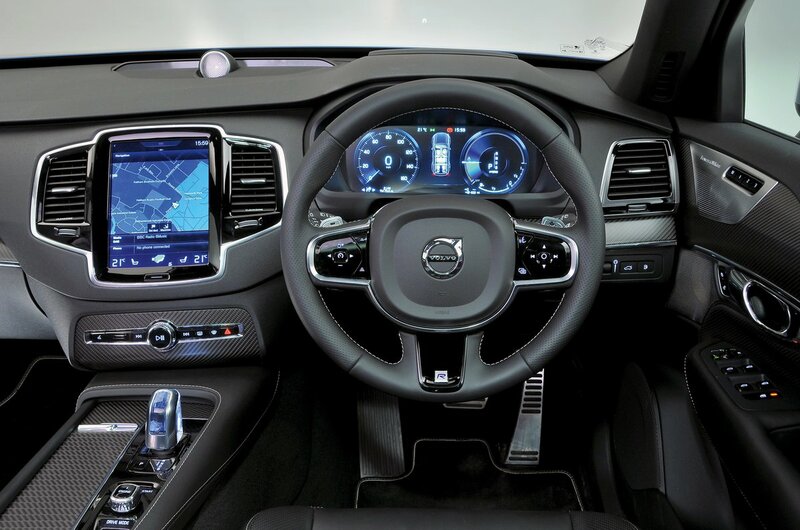 The pedals line up nicely with the driver’s seat to ensure there’s no skewed driving position, while dashboard buttons are kept to a minimum, with most features operated from the large, tablet-style 9.0in touchscreen. This isn’t as great as it sounds, though, because while the dashboard looks clean and minimalist, it’s not always easy to use the small on-screen buttons without diverting attention from the road. Even the climate control has to be operated via the screen – which is way more distracting than using old-school physical buttons. Happily, large windows all round make the XC90 easy to see out of, and thinnish front pillars help when navigating roundabouts and junctions. Even the over-the-shoulder view is good for such a large SUV, unless the third row of seats are in use. Not only that, but every version comes equipped with front and rear parking sensors as standard, making it easier to manoeuvre its large bulk into a tight car park space. You can also add a rear-view camera, a 360deg camera and Park Assist Pilot (which helps you when parallel and 90deg parking). We firmly believe that the least distracting infotainment systems are those controlled via a rotary dial – as found in the BMW X5 or Audi Q7, for example – rather than touchscreens. Volvo has chosen to go down the touchscreen route. Now, as these systems go, it has its plus points, such as a large, extremely high-definition 9.0in tablet-style screen. As with all touchscreens, though, small icons are trickier to use on the move than physical buttons or options selected using a dial controller, and with so many operations incorporated into the screen, the menus can be confusing to work through. Familiarity will at least make that last point a less contentious one, but it’s not quite as instantaneous in responding to your inputs as the best systems out there, either. There's no doubting the number of features it offers, though. You get DAB radio, Bluetooth and voice control functionality, and Apple CarPlay and Android Auto, which facilitate using your smartphone’s apps from the screen, are part of a reasonably priced add-on. A system called Volvo On Call offers on-board wi-fi and you can also download an app to your phone that lets you forward a route map to the sat-nav or activate the climate control remotely, so you can get the temperature just right on hot summer afternoons or cold winter mornings. The standard 10-speaker stereo sounds good, but there’s an excellent 18-speaker Bowers & Wilkins upgrade available if you fancy pushing the boat out. As is always the case, you get what you pay for, so the top-level Inscription trim feels the plushest, with fine-grade nappa leather seats and dashboard trim, as well as swish, walnut inlays. Then there’s the T8 model’s unique touch: a blown-glass gearlever sourced from a specialty Swedish glassmaker that looks and feels particularly splendid. 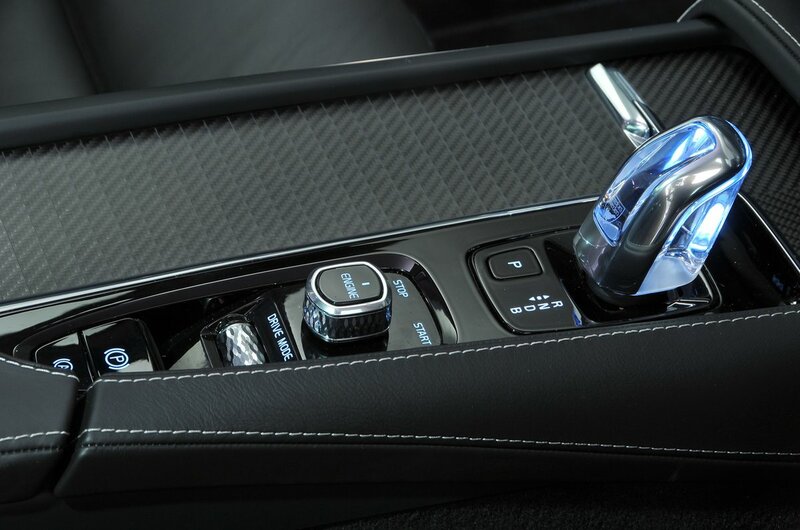 But even entry-level Momentum trim offers what many will agree is a sharp-looking, high-grade interior finish. Quality materials are used in all the key places, along with substantial-feeling switches and buttons; R-Design models add sporty metal inlays, too. It has to be said that you don’t get quite the sense of impeccable robustness that you do from a Q7, but that’s Audi pushing to extreme boundaries rather than Volvo dropping the ball.